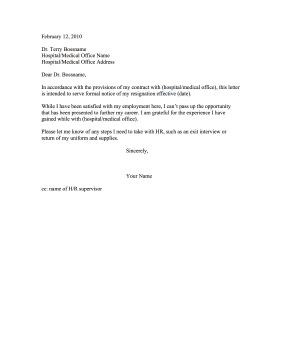 Nurses moving on in their careers can use this printable resignation letter to depart from a hospital, clinic, or medical office. In accordance with the provisions of my contract with (hospital/medical office), this letter is intended to serve formal notice of my resignation effective (date). While I have been satisfied with my employment here, I can't pass up the opportunity that has been presented to further my career. I am grateful for the experience I have gained while with (hospital/medical office). Please let me know of any steps I need to take with HR, such as an exit interview or return of my uniform and supplies.